It’s no surprise that many people are feeling a bit overwhelmed by today’s Real Estate market. It’s up; it’s down, with foreclosures all around. This is a confusing time for home sellers because a couple years ago, a good percentage of homes were selling in as little as a few weeks, some with multiple offers. In today’s market we have more inventory and ever changing interest rates. On one hand, buyers have more choices when seeking to purchase. On the other hand, home sellers have more competition in attracting a buyer for their home. In both circumstances, it comes down to the home owner delivering a product that buyers are seeking. Clean, well balanced, neutral and inviting spaces that showcase all the features the home has to offer. With so many homes having the same floor plan as the next, it is imperative that homes be designed in a manner that differentiates them from their competition. Hiring a Professional Stager works because many homeowners are not able to look at their home objectively with “buyer’s eyes”. People live in their home the way that works best for them but this is typically not the “look” buyers get excited about or make higher offers for. Staged homes statistically receive 3-10% higher offers than homes that are not staged. So, what do I say to motivate my clients to make the needed changes? When I am preparing a customized staging plan for home owners, I typically refer to the trends of buyers when trying to motivate a home seller that is unsure about committing to my suggestions. I am not the reason they need to make changes – the consumer who is demanding a certain level of standards is. - Buyers are seeking move-in condition homes and willing to pay more money for them. By addressing these things now, you will appeal to a broader audience of buyers. - Neutralizing so buyers can envision their belongings in the space will help them form emotional attachments to your home. Emotional connections procure offers. - Buyers find the space easier to relate to and more valuable and relevant to their wants and needs when rooms are staged in the manner in which they are meant to be used. For example a dining room should be staged as a dining room rather than an office or play room. - I am here to help you sell your home faster and for more money. All of the advice I am giving you is based on increasing your bottom line. - By following through on these suggestions, you improve your chances for a quicker sale. If by selling faster you save at least one price reduction, you will retain several more thousand dollars of equity in this home. 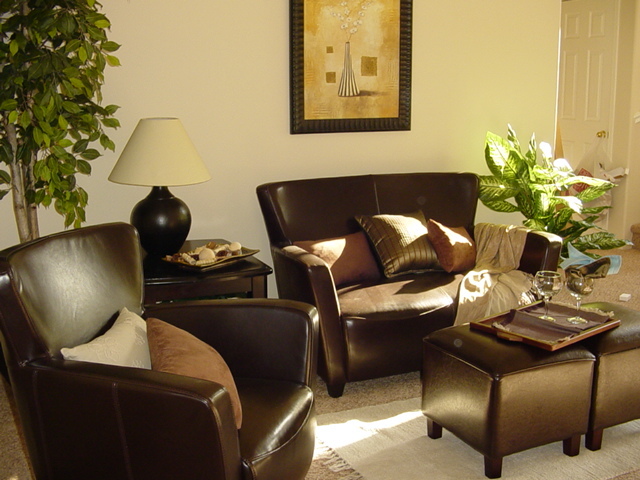 - Staging every room in your home creates a consistent look and feel. The more attractive your home is, the higher the offers people will make. Why? Because in our society, people expect that highly attractive things usually cost more and we tend to “bargain” less when something is just what we have been looking for. For more information on staging, please visit our website at www.preparedtosellstaging.com. Former real estate agent Kim Kapellusch has over 10 years experience staging interiors for commercial advertising, vacant and lived-in homes, model homes and personal residences. Call Kim today with your project details and get an over-the-phone estimate. Specializing in staging lived-in and vacant homes. How to Become a Home Stager in 5 days?! Have you always dreamed of having an exciting career in design but didn’t want to spend tens of thousands of dollars and years in training? Are you like me? Watching all the design shows on tv and wondering, how can I do something that is rewarding, challenging, fun, creative, and here’s the big one……….get paid for it? Preferably, enough money to make a good living…..
One day, my Mom was telling me how my cousin had hired a stager to come in and stage her home for sale. She said it sold in less than 2 weeks while others in the area had been sitting for months. Many of her neighbors had taken price reductions of ten to fifteen thousand dollars per adjustment while my cousin had only spent 2,000 getting her home ready and sold in 12 days for almost full price. I was happy for my cousin, but why all the talk about home staging? Then the conversation took an interesting twist. My Mom told me that my cousin was thinking about becoming a home stager and that anyone could become a stager in just 5 days of training!!! Could this be true? 5 days?? I could hardly believe my ears. Could I really become a designer of homes in 5 days? Sure enough, after researching, I discovered many “schools” delivering a complete ‘business in a box’ program for home staging and never looked back. Today I am a successful home stager with a school of my own located in the beautiful town of Valencia, located in northern Los Angeles County in California. I have incorporated all of the things I thought were missing from other training programs and have what I consider to be the most comprehensive home staging program available. For a fraction of the time and cost of traditional design schools, you too, can learn the craft of home staging and be paid handsomely for your professional skills that help homeowners retain as much profit for their home as possible. What can you expect to learn in a Home Staging Program? The investment in home staging training can save you thousands in costly business mistakes. In a good home staging program, you will learn trade secrets that take years to learn and develop, along with staging specific business and marketing essentials that enable you to start a staging business immediately upon graduation. In addition, some programs teach space planning, color theory, design essentials, and have multiple in-field exercises where you will gain invaluable design and critical thinking skills. Small class size, and a format that allows you to ask questions, is also a plus. Research is the key. Many programs are 3 days instead of 5, or only have 1 in-field exercise or assume you already have a design background and gloss over this area. There are online programs as well but if you are a person that learns by doing, then reading a book or watching a video about how to be creative, rather than experiencing the actual creative process, may not be for you. Click here for more information about choosing the right home staging design course for you. http://www.theacademyofhomestaging.com/8qs.html. Awaken the inner designer in you and start a new career in 5 days!